The number of soundbars entering the market has been growing at an astounding rate, so I was not terribly surprised to hear that Sonos was entering the fray. The Sonos Playbar (Sonospeak for soundbar) can compete with other soundbars as a powered three-channel soundbar, but it has one feature up its sleeve that puts it in its own category. Unlike every other soundbar available, the $699 Sonos Playbar has a built-in Sonos receiver. I suspect that most of you are familiar with Sonos, but for the few of you who are not, Sonos is a music streaming system, consisting of hardware and software that allows the wireless streaming of music from your computer system or a variety of online streaming sources. While there is now a huge number of these systems available on the market, Sonos has a combination of robustness, feature set, and ease of use that keeps it at the top of this market. For more information, please see our prior review of the Sonos Play:3. 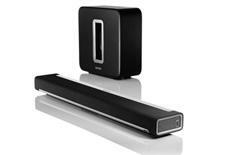 • Read more soundbar reviews from Home Theater Review's writers. • Buy the Sonos Playbar on Amazon.com here. The Playbar is a three-channel active soundbar that can be expanded to a 3.1, 5.0, or 5.1 system with the addition of other Sonos items. While the channel options are pretty commonplace, the Sonos Playbar's streaming and network capabilities and the way Sonos implements the additional channels puts it in its own class. The ability for the Playbar to play any music you have stored on a network computer or from a large number of compatible streaming services via the Sonos system gives the Playbar unparalleled flexibility and ease of use. The Sonos Playbar measures roughly 35 inches wide by 3.5 inches by 5.5 inches. I cannot really say if it is 3.5 inches high and 5.5 inches deep or vice versa, as the Playbar can be set up either way. The front and top sides of the Playbar are wrapped in black fabric with silver/gray aluminum and plastic accents and panels. Regardless of setup orientation, your view of the Playbar will be primarily that of black speaker cloth with an accent panel containing a silver strip at the bottom and a small IR receiver window toward the right. If the wide side is facing forward, the accent strip will have the Sonos logo in the center. With either orientation, the listener is provided with a clean-looking and unobtrusive speaker, which is fine by me. The last thing I want below my television is something that would provide a visual distraction. The wide side has a pair of feet; each foot has a keyhole mount to allow wall-mounting without any additional hardware. 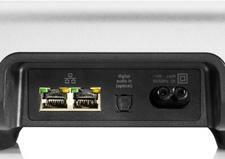 The narrow side that would face the back or bottom has a recessed panel to connect the AC cable, optical digital input, and a pair of Ethernet ports. Lastly, the side panels are mesh grilles trimmed in the same silver/gray color trim rings. One side has the traditional Sonos control panel, consisting of a volume-up/-down rocker switch and a mute button (which can also function as a play/pause button thanks to a recent software update) separated by a small status light. The clean and simple exterior hides a complex interior with nine separate drivers, each with its own channel of Class D amplification, an accelerometer to determine orientation, a wireless receiver, and sound processing circuitry. The Playbar has a pair of 3.15-inch aluminum midrange drivers and a one-inch titanium dome tweeter for each of its three channels. All nine drivers are mounted on a rigid 45-degree baffle. The angle of the baffle allows the Playbar to be used with either the narrow or wide side facing the listener. I connected the Playbar to an older 42-inch Panasonic plasma TV, placing it on a shelf immediately below the television with the narrow baffle facing forward. The only physical connections that had to be made were a power cable and the optical digital audio (Toslink) connection between the television and Playbar. I have had a Sonos system up and running in my house for about two years now, so the software was already running on my computer. I simply opened the Sonos application on my iPad and added the Playbar to my Sonos system. The Sonos application then walked me through setting up my television's remote to control the Playbar's volume, and I turned off the television's internal speakers. Some other setup options are available in the Sonos application, including options for "Speech Enhancement," "Night Sound," loudness, lip-sync delay, IR signal light, and IR repeater. I initially left all these at their default positions but turned off the white status light on the side panel, as it was bright enough to be distracting in a dark room. Read about the performance of the Sonos Playbar soundbar on Page 2.